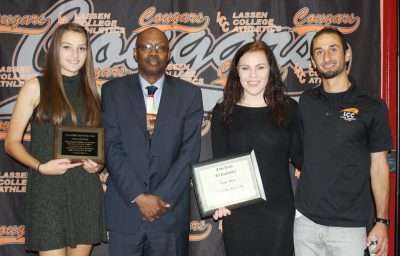 The Lassen College Athletics Department hosted the annual fall sports banquet Monday, Dec. 11 to recognize the accomplishments and efforts seen throughout the soccer, volleyball and wrestling season. In addition to the awards and honors presented within each sport, one athlete from each team was given the Marlon Hall Jr. Memorial Award. In memory of Marlon R. Hall, the award is given to a student athlete in each sport who exhibits the character, leadership, passion, enthusiasm and teamwork while taking part in the athletic department at Lassen College. The first team to be recognized was Lady Cougar volleyball. Head coach Julie Brown commended the women for their team building, hard work and dedication. Though the Lady Cougars didn’t finish the season with the best overall record, Brown commented that the 2017 season was a great building year that will hopefully result in some great games during the 2018 season. At the volleyball season’s end, both Koral Hearn and Keelin Pilgrim were honored with All-Conference Honorable Mention. In addition, Krysti Collier finished her career at Lassen College in the Top Five in the Conference with digs as well as digs per set. Hearn finished second in the Golden Valley Conference in blocks. This year’s volleyball recipient of the Marlon Hall Jr. Memorial Award was Gabi Geoia. Next in the spotlight was the women’s soccer team. Head coach Imaan Kerchgani commented that his first season coaching the Lady Cougars was one full of team building. The women’s soccer team ended their season with a 3-9 conference record and a 5-14-1 overall record. Lassen was able to transfer all sophomores to a variety of Division I, Division II and NAIA schools on scholarship. Emily Upstone was awarded First Team All-Conference and Brenna Mendonca was recognized with Golden Valley Conference Honorable Mention. 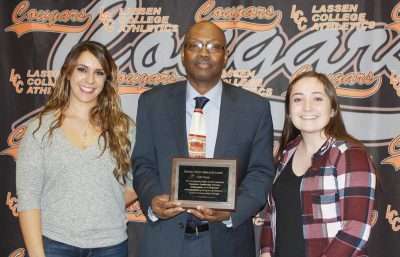 Mendonca was also recognized by Lassen College with the Marlon Hall Jr. Memorial Award. Wrestling head coach Francis Beaujon took the stage next to recognize the four matmen who persevered through the season. Though the roster was small, the Cougar wrestlers made a large impact on the Big Eight Conference. This year was the first in which Lassen College had the opportunity to host the Northern California Regional Championships. Of the four Cougars, three qualified for the State Championships held over the Friday, Dec. 8 weekend. 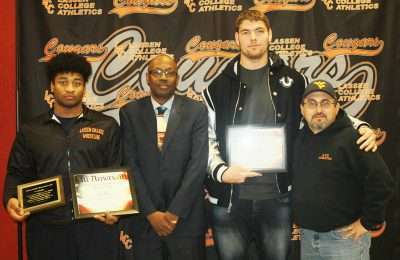 While there, Tevin Bailey and Cole Mair earned All-American honors for the 184-pound division and the 285-pound division, respectively. Bailey was also the recipient of the Marlon Hall Jr. Memorial Award. Next to take the stage was men’s soccer head coach George Kee. The Cougars finished their season on top of the Golden Valley Conference with a record of 9-1-2. 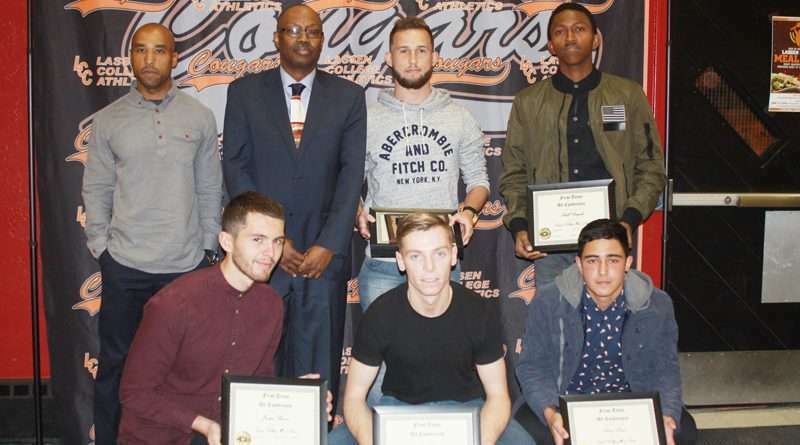 Additionally, Carlos Eduardo finished second in the state for goals with 20 recorded, and Adolf Bitegiko finished first in the state for assists with 24. 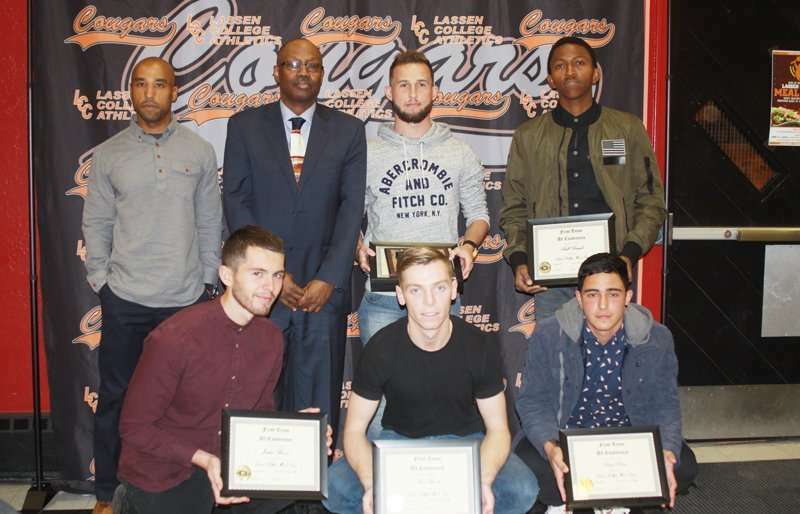 This year, six Lassen athletes were awarded First Team All-Conference: Sean Lynch, Jordan Brown, Lucca Lima, Adolf Bitegeko, Carlos Edwardo, Sean Lynch and Daud Aboud. Kee introduced Lynch first, saying, “I’ve never seen anyone play this hard on the field. In addition to being named to the First Team All-Conference, Bitegeko was also named the Golden Valley Conference Offensive Player of the Year. In addition to earning a spot on the First Team All-Conference, Edwardo was named Golden Valley Conference Most Valuable Player. He later was presented with the Marlon Hall Jr. Memorial Award. The fall sports season showed a new level of dedication from the many student-athletes of Lassen College. As of now, the athletes are still hard at work in the off-season to prepare for the many games ahead of them in 2018.